Went shopping for lamp parts today, one large and one small. The small one is a vase cap, to be soldered to the top of my lampshade. The store's entire selection of vase caps came only in this brassy color which bears no relation to any stained glass patina known to man. I asked if the vase cap can be patinaed to match the lampshade---still haven't decided what patina I'll use, but will probably go with black. The answer was that the vase cap can be patinaed but will probably want to be tinned first. Tinning, of course, is applying a thin covering coat of solder, i.e. : prime opportunity to burn myself. Watch this space. The big part for which I was shopping today was a lamp base. There are probably people who eschew "store-bought" bases in favor of hand-building something complex and unique, but I feel like I'm doing okay to have built a shade---I don't need to actually build a lamp. I'm okay with that. I didn't have glass class this week. We were originally supposed to, then last week, someone in the class suggested skipping Memorial Day's class and finishing a week late. Everyone agreed, which is to say, everyone else agreed and I abstained, seeing the numbers were against me. So the holiday meant I had to wait two whole weeks to do the last couple of hours of work on my lamp. Fortunately (or not) I've been so busy with work that I haven't had time to be impatient about building pretty glass things. Even so: this Monday, I'd better be coming home with a finish-soldered, wire-wrapped, vase-capped, patinaed, polished-shiny lampshade. I have a spot for the finished lamp all picked out and everything. That is a gorgeous lamp, Michelle! Is it going to go in the living room after all? Hopefully your husband-to-be has warmed up to the idea! I think your stained glass talents complement your work as a tech person quite well. I think I have successfully appealed to my sweetie's sense of fairness in giving the lamp a home in the living room. If he kicks up any more fuss over it, I'm going to ask him whether, when our kid comes home from kindergarten with some horrifically ugly drawing and a big proud smile, he would refuse to put it up on the refrigerator on grounds of it not meeting his own aesthetic ideal. So that's my ace in the hole. Shhh. It's not absolutely necessary to tin a vase cap before applying patina. Scrub clean first with steel wool, then apply as normal. It will take more coats and more rubbing than without the tinning, but will darken eventually. If your not sure, try on the inside of the cap first. The problem with tinning the vase cap (apart from burning oneself) is that it can be difficult to get a nice smooth surface without lots of solder blobs. Depends on how much of the antique look your going for I guess! 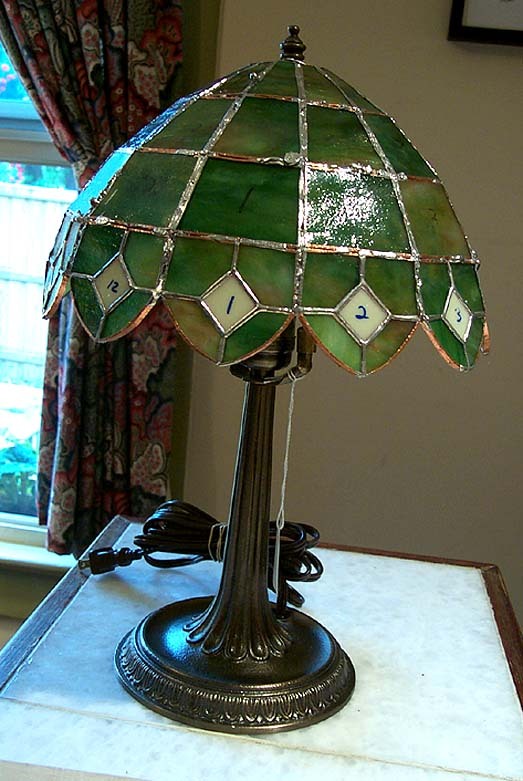 I'm trying to find a place I can purchase the lamp parts for the tiffiney style lamps. Do you have any sources? Thanks.